Three LSU Law traveling moot court and trial advocacy teams brought back a number of award and honors from their competitions this weekend. 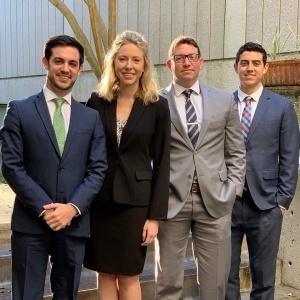 The Tom Fore Phillips National Moot Court team (students Ashley Delaune, Justin DiCharia, and William VanDehei) competed at regional rounds of The National Moot Court Competition, which were hosted by Faulkner Law School in Montgomery, Ala. The team was coached by Prof. John Devlin and Advocacy Fellow Annie Scardulla. The team won First Place Best Brief in the region, which includes all law schools in Louisiana, Mississippi, Alabama, and Tennessee. The team ultimately placed as semifinalists, losing in a close and ultimately split match against the University of Alabama on Saturday afternoon. Also, LSU Law’s brand-new-this-year ABA Negotiation Competition teams enjoyed remarkable success at their regional rounds in Houston. Coached by Scardulla, LSU Law fielded two teams of students to the ABA Negotiation. “Purple” team members Matthew Braquet and Kelsey McGill ultimately placed as semifinalists in the Top 4 teams at the regional, and “Gold” team members Jared Matte and Jared Rovira placed sixth among remaining teams. The Purple team narrowly missed advancing to the National Finals, winning two ballots to SMU’s three ballots in the Semifinals. Congratulations to our students on their success, and to the team coaches and guest judges for their hard work and dedication. 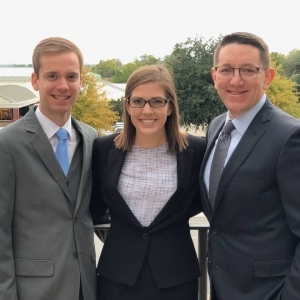 The Tom Fore Phillips National Moot Court team of, from left, Justin DiCharia, Ashley Delaune, and William VanDehei.